Jeffrey, another way to answer your question is to point out the actual tax revenue collected. In 1985 (the year prior to the larger tax cut) the federal govt collected $734B. Collections grew 41% to $1,032B in 1990, or 7.1% per year for five years. If you want to extend it another five years, collections grew 84% to $1,352B in 1995, or 6.3% per year for ten years. Or look at tax collections as a % of GDP: 17.2% in 1985, 17.4% in 1990, and 17.8% in 1995. 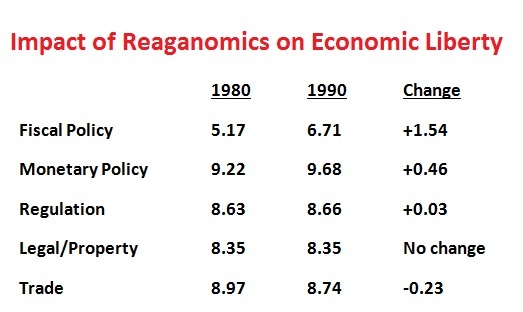 Hard for me to see how the Reagan tax cuts ‘cost’ any revenue. Strong economic growth solves a lot of problems! They can claim whatever they want but the facts are laid out in Dan’s all yellow chart above. When talking about a cut from 35% to 25%, which is a difference in keep-home of 65% to 75%, or only a 15% increase; the Laffer effect will not be as obvious, because the tax effect might get buried by other issues like increased regulation or changes in the business climate. In the three cases above, it was the tax code change that affected everything else. Nedlandp, a lot of people, particularly liberals, claim that Ronald Reagan’s tax cuts cost government revenue. Any validity to the claim or is it all b.s. in your opinion? Excellent data. Thanks for posting this! 2. Tax reform must by definition be revenue neutral; thus, tax cuts are not reform. — So government extracting less money from people isn’t a reform? 3. Dynamic scoring is a gimmick. It’s okay only if the answer makes a small reduction in the consequent deficit, but it can’t make a big one. — Nothing like condemning the method if you don’t like the answer. 4. Current proposals are “budget busting.” — So why not cut spending to balance it out and get two wins? 5. The proposals are “regressive.” — He acknowledges that the higher standard deduction helps middle class, but he should be smart enough to know that making the rates less “progressive” doesn’t make the package regressive. 6. He completely ignores the proposed reduction in deductions — most notably the removal of state tax deductions.. — I’d go further and remove them all, but at least this is a start. He should like removing state tax deductions which will hit the higher income folks more. Not all tax cuts pay for themselves given enough time. Obviously, you can’t cut tax rates to zero. If you have not cut spending, you have to borrow the difference and the lower the tax rate, the higher the interest rate at which you borrow. At some point, interest paid on government debt directly affects rates on corporate debt and growth must slow. Another thing about tax rate cuts: The Mellon cuts in the 1920’s went from 73% to 25%, which means that tax payers went from keeping 27% to keeping 75%. The Kennedy cuts went from 93% to 70%, keeping 7% to keeping 30%. Reagan went from 70% to 28%, keeping 30% to keeping 72%. My point is that the three examples that everyone uses to support Laffer cuts involved dramatic changes in after-tax earnings. W’s cuts, not so much. The closer you get to zero, the less impact the tax change has on retained earnings and the Laffer effect gets smaller. The wealth of nations depends on the Rahn Curve, not the Laffer Curve — and the Rahn curve peaks much sooner than the Laffer one — and we’re way past the Rahn peak. In case people have not noticed our trendline growth is now half the world average. That has virtually never happened in American history. It’s a first — and thus so is the trajectory of decline we’re on. Claiming that bigger government is the solution is asinine. The growth deficit becomes all the more stark once one realizes that what used to be great growth no longer is. Even one quarter of one percent growth in the Middle Ages or ancient times was stellar. 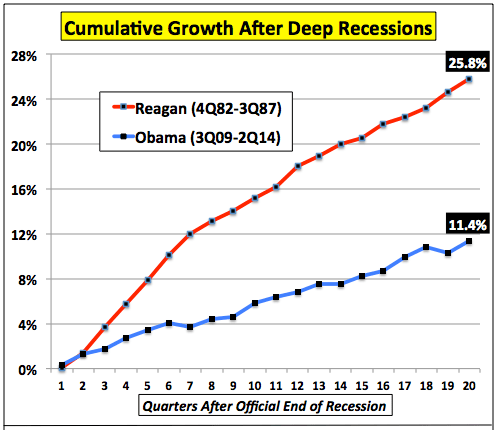 One percent growth in the seventeen hundreds was also stellar. So was two percent in the eighteen hundreds. Today, when average world growth trendlines at 3-4%, and accelerating in the long term, two percent growth is dismal. It’s a trajectory of arithmetically deterministic decline. If a tax cut induces someone to build a factory, you cannot expect that factory to pay for the tax cut in year one. Even if a tax cut only increases growth by 1%, that increase in the size of the base continues on for every year thereafter. The opposite is also true. No matter how many changes are currently made in the tax code, our economy can never recover growth lost during the Obama years. You are confused on several levels. Dan is right on all counts. This is all quite factual and data-based, if you have an open mind. First, tax cuts do not ‘give’ wealthy people more income. It allows them to keep more of what was already theirs. Second, you may be confusing tax rates with tax payments. A reduced tax rate can lead to people paying as many tax dollars as before, or maybe even more. That’s because the lower tax rate gives them more incentive to increase earnings and less incentive to avoid taxes. Third, you exalt spending too much. Saving money is also very good, and required for prosperity. The argument that it’s good for the economy to take more money from the rich (because they don’t spend it all) and give it to the poor (because they will spend it) is very weak. Money saved is still spent. It typically funds investment in things like business expansions, equipment upgrades, and innovation. It is a widely accepted fact that capital investment is associated with higher worker incomes. Fourth, this is not so much about the dollars themselves. It is more about increasing the incentives to work and invest, while also reducing the incentives to avoid taxes or engage in tax-induced game-playing. Well – good luck with the notion that giving the wealthy more income by way of tax cuts, will help. If you haven’t noticed, one of the reasons the wealthy are wealthy is that they take care over their spending. And they certainly don’t go out and spend the tax cuts.